Wishing you many treats and only fun tricks!! 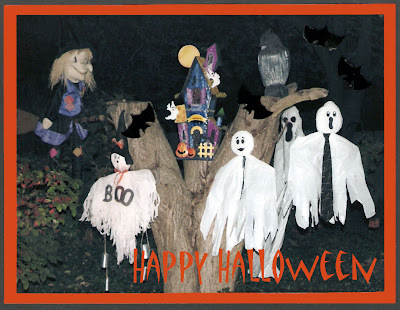 This a card that I made from a photo of a Halloween exhibit on the remains of a spreading Chestnut tree. Peach Keen Stamps is having a challenge to create a card using a haunted house somehow in your card, a bat, a ghost, a Halloween greeting, a ghost, using die cuts, stamps, punches, images on papers... etc.. anything goes! So I added some cut out bats (hope you can see in the sky) on the photo and made this card to fill their spooky requests. May you be safe from all the Ghosts and Goblins! Crazy 4 Challenges for this week is to create a card using at least three different geometrical shapes........Squares, Circles, Rectangles, Octagons, Triangles.......you name it, just make sure to have three of them on your card! Nina's STV Color Challenge this week is Cranberry Tart (or Burgundy), Green Apple (or Olive), and Ivory. I made this card to fit both challenges. Used triangles, oval, rectangles. Added green ribbon strips. Let it snow, but not really! 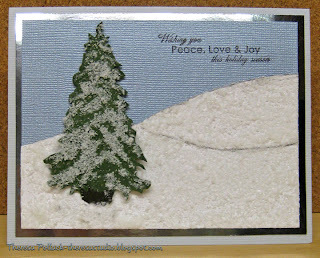 Lynn's Potluck Friday Challenge on Stamp TV this week is to use snow in a card or project that is either stamped, colored, glittered or liquid appliqué...your choice, but you'll need to have snow somewhere on your project. I was inspired by the styrofoam snow that I saw on the cards by Karen last night on the blog hop so I found some styrofoam from an old project and made snow, not enough for skiing but enough for this card. I cut out my hills from white CS and added the snow and matted this to a textured metallic blue CS. I stamped a tree on green CS, cut it out, and made it snow again. I added a little glitter to the tree with a Sakura pen. I attached the tree. Matted the snow scene to silver metallic CS and placed on a light blue base. Stamped sentiment. not enough time to redo. Thanks for leaving a comment....I enjoy hearing from you! My friends Olga, Linda, and Patti have bestowed me with this fun badge award! Thanks! I am so honored. Olga is always so encouraging and has such a great sense of humor! I know she always put a smile on my face, is very creative and such an early riser! Linda is one of the hardest workers and one of the most creative persons that I know. Patti is the one who encouraged me to start this blog and I have met so many wonderful people like her through blogging. They all have great senses of humor which is a great trait to share. These three ladies are so much fun to know and are always so full of great ideas! I now have to tell you 5 things about myself and then am suppose to pass the award onto 5 of my friends. 1. I have the most wonderful, supportive, and romantic husband on the planet. We have been married 32 years this month. 2. I am originally from Tennessee and my DH is originally from New Jersey and we met in New York City. We dated long distance for 2 years before we married even though he asked me to marry him on our 2nd date! 3. I worked as a retail executive for 35 years...first in Nashville, TN as a buyer for Allied Stores (Cain-Sloan) and later as a buyer and in store management with May Co. ( O'neil's, Kaufmann's, etc). I happily retired in 2001 long before Macy's took over May Co. My timing could not have been better. 4. We will be spending 6 weeks of the winter in Captiva Island, Fl where we have been vacationing for 20 years. I see that most of my followers are already recipients of this badge so I'd like to pass this award on to all the bloggers who visit here because you make me smile when you stop by. Sorry I missed last week's challenge at CCS but back this week for the "ALL about Buttons" challenge. I copied an idea from Jennie to make background paper using the sentiments from the Holiday Seniments stamp set. I also used the tree Stamp from Let it Snow. Not very original ...just an old copycat! I stamped the tree on white CS after I embossed an oval in the center. Then I masked the oval and stamped the sentiments. Because I did not like the look of this, I added some red ribbon( to hide a goof) and a red frame cut with nesties. Next time, I'll stamp the background first and then stamp tree separately onto the oval and attach. Now for the buttons--I had these tiny pearl buttons that I painted with a red Sharpie and attached with glue dots. Make sure to let dry before handling. Check out the blog hop going on over at http://creativeclearstamps.blogspot.com/2009/10/blog-hop-today-win-candy-and-badges.html Chances to win Candy and bages. While there, check their challenge too. This week at Just Us Girls the challenge is to make a project using a 3-D flower. They are showing a great tutorial on how to make a tissue paper flower. I made a flower of blue tissue paper using a button in the center. My card base is a yellow green CS with a mat of blue CS. 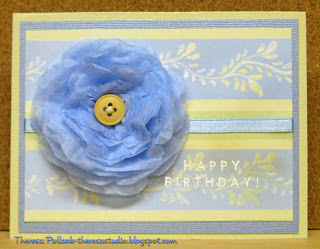 I layered this with a patterned paper from my stash with a blue ribbon across one of the stripes. I stamped Happy Birthday with versamark and heat embossed with white EP. Finished by adding the flower. I am glad to be back home after being in Tennessee for several days. My last living aunt passed away while we were visiting there so it was a longer and sadder trip than we had planned. She was 84 and had been suffering with cancer for the past few months. I am having a difficult time getting back in the swing of things but did manage to do some carding today. Hope to get back to doing some regular blogging and checking out what everyone has been doing. I made this card for her challenge. I cut an oval in Pure Ivory and stamped, inked, and sponged as shown. I placed on a scalloped oval of Pumpkin Spice. My rectangle mat is from Gina K's DP All About Autumn matted on Chocolate Kiss. My base card is Pumpkin Spice with a mat of Chocolate Kiss layered with Pure Ivory. I cut strip of Brown CS and added a gold ribbon. Added the print mat and scallops. Attached a butterfly cut out that was colored with markers and glitter pens. Finished with 2 copper brads. Stamps: Gina K-Melanie's "A Year of Leaves"
Will be away for a few days. Going to visit my Mom in Tennessee. Will see you soon.. 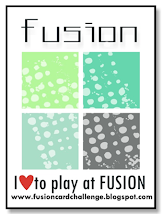 The challenge at JUGS this week is to use these three colors : aqua, red, and cream. http://bee-crafty.blogspot.com/. I printed on cream cs and colored with red and aqua. I matted on red cs and attached to an aqua mat that I embossed with Cuttlebug and added some glitter highlights. My base card is cream. Today is Sweetest Day which is celebrated on the third Saturday of October. This holiday is not observed in many places, mostly in the Great Lakes region and the Northeast, and was began in Cleveland in the 1920's mostly to promote sales of candy and later sales of greeting cards. I made this card for my sweetest DH who loves his teddy bears. 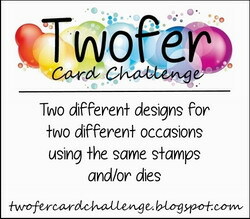 I used Donna's sketch for the Stamp TV challenge this week for inspiration. 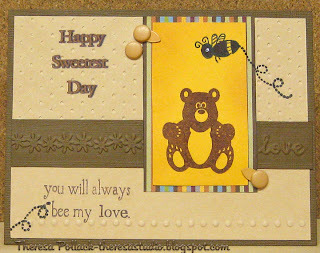 I used a bear and bee stamp...nothing is sweeter than honey for my own Teddy Bear....and the bee sentiment expresses my love. Printed greeting on the computer. Added some embossing with Cuttlebug and some honey brads. Happy Sweetest Day to All! 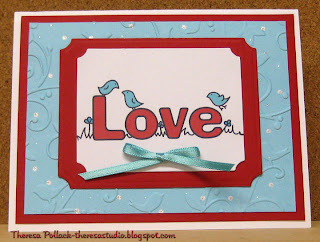 Lee's Potluck Friday challenge at STV this week is to use **only** stamped sentiments, greetings, etc on your card!!! No fair just using dp either.......you gotta STAMP a greeting or sentiment too. I decided to use a Happy Holidays stamp for my focus. I stamped it with Versamark and heat embossed with gold ep on ivory cs. I framed it with cranberry cs that I cut using 2 nestibilities. I attached this to a mat of digital paper that I edged with a gold marker and embellished with a glitter pen. Added a couple gold ribbons and a cutout tree covered with gold glitter. Another Christmas card! 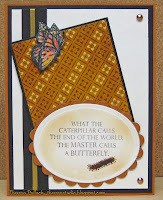 This week's Sketch Challenge at Card Positioning System http://cardpositioningsystems.blogspot.com/ is sponsored by Clear & Simple Stamps. Thought I'd give it a try and make a very simple and quick card. I began by stamping a simple flower design and sentiment in a window on to white CS and cutting with a nestabilities. I used a green base card . Added a strip of dark blue that I embossed with CB Argyle folder. Attached my stamped image and did some paper piercing. Very Quick and Simple! Kay chose for this week's STV color challenge: Cranberry Tart, Fresh Asparagus, Light Blue, and White as the neutral. I colored a stamp with markers and stamped on White CS that I cut with nestabilities. Placed this on a mat of Cranberry cut with nestabilities. Layered on to a Blue mat printed with a computer generated sentiment. Attached to a CB embossed Green mat with eyelets. Used Cranberry base card. This week Creative Clear Stamps Challenge was all about Scallops in a card. Using the Turkey Day set from CCS, I stamped the turkey and sentiment on an oval of ivory CS and colored with markers, pencils and glitter pens. I matted this on a scalloped oval of metallic copper CS. I slipped another scalloped oval of pumpkin spice cs at an angle under this on which I stamped "Gobble Gobble". This I attached to a mat of digital paper which has some scallops and circles in the design and outlined this mat with copper paint pen. I used a base card of pumpkin spice. Gobble! Gobble! Thanks for waddling by! 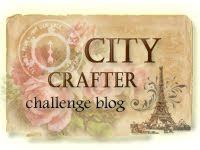 This weekend I came across a new challenge blog in a discussion by Maria on StampTV. The blog is Just Us Girls-JUGS for short at http://justusgirlschallenge.blogspot.com/ . Good luck to them on their new endeavor. I decided to make a card for their challenge this week to use Paper Piecing as a way to add color and pattern to your stamped images. Optional: use pink somewhere on your card in honor of Breast Cancer Awareness Month. I used a freebie digital from http://bee-crafty.blogspot.com/ that I found sometime ago and saved. Since JUGS is all about girls, I decided this would be the theme of my card. I printed the girl image on ivory CS and paper pieced her dress with the pink pattern paper, made the collar with a corner lattice punch, the hem with scallop scissors, and punched flowers for the basket. I colored her hair, flower in her hair, the shoes, and basket with markers and pencils. I cut her out with an oval nesties and cut an scallop oval of the pink print. I decided to layer her on the scallop oval laid cross-wise because it made her look more heavenly. I embossed the ivory CS used as the base with CB Swiss Dots. Embossed a strip of pink that I had stamped with a sentiment "Be a Friend" with a CB Border and attached to the card along with my friend. Finished with a bit of bling in her flower. Lori's Potluck Friday Challenge is to make a Kick Stand card. This was a first for me....had to check out how to do it and found it to be a fun card to make. Decided to make a "Turkey Day" card since I had just received these new stamps from Creative Clear Stamps...great stamps....fun and a great value too. I made the base card with kraft CS and lined inside and on front with a Karen Foster Design paper. This paper has a thread of metallic in it but does not shown in photo...take my word for it. I cut a rectangle of copper CS with nesties and a smaller one of kraft CS that I stamped with a turkey and sentiment in brown. I sponged and colored the turkey with markers. I added the ribbon with copper leaves to finish the front. I also finished the inside with some stamping and covered the back of the copper CS with another piece of the copper CS that I customed cut using the nestie. See smaller picture for details. It was in the 30's early this morning which means that the trees will be turning color very quickly and there will be a lot of leaves to rake. And at our house, that means a LOT of LEAVES. Another card that I made with Linda's STV challenge sketch was inspired by the photo that my DH made a few years ago and is one of my fave fall shots. I printed this photo to the size that I needed on watercolor paper...don't know why I used WC paper ...could have used regular CS....guess I thought it'd look more artsy. I cut an oval out of the picture using nestabilities. I then covered it with versamark and heat embossed with clear EP...again do not know why I did this step...wanted it to look like a painting? I matted the picture on a scalloped oval of Pumpkin Spice CS and edged with a brown marker. I used a brown base with mat of khaki CS . I used strip of patterned paper that matched the pumpkin spice and placed on mat of brown. I used strips of brown organza ribbons. Mounted the ovals on the card and finished with a great button and the word Autumn that was stamped on another scrap. Save time to enjoy the fall foliage! Have missed a few days ....due to my cold and bite....finally over the bite on Friday when swelling was finally gone. Did work on some cards but behind posting. Going to try and catch up today. Love Linda's sketch challenge this week on StampTV. She does beautiful designs and this one was fun to work with. 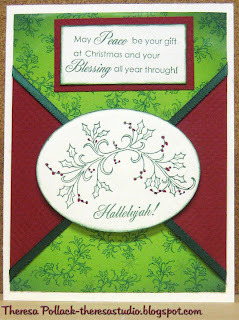 I did two cards...this one was a Christmas design in which I used some of the new digital papers from Gina K's Deck the Halls. Here's my card. I began with a base of red CS and layered a mat of green Holly CS that I edged in gold. Next a strip of striped CS that I layered on a mat of red. Attached red ribbons to the card. I cut a scallop oval of red and oval of white that I stamped with sentiment and sponged with green. I affixed ovals on the card and added silk poinsettia to finish. My week did not start off great. I woke up Monday with a sore throat and a cold....too much garden work outside this weekend in the damp I guess. Later that morning, while I was on the computer I felt a bite on my leg. Must have been a spider that crawled up my robe....yes, was still in my robe...felt too yucky to dress. The bite began to itch a little but by afternoon my leg was swelling and I spent the day laying with a ice pack on my leg. My DH said at least the cold and bite coincided so I could recover from both at the same time. Tuesday morn, my leg had swollen a great deal more and it was difficult to walk. So another day spent with the ice pack and nursing my cold. My DH has been a great nurse keeping my ice pack cold and feeding me. Today, Wednesday my swelling has gone and I can walk again but the cold is still with me but not as bad. I finally feel good enough to sit here and post a card that I made before the bite became so painful. Using a sketch from Card Positioning: CPS136, I used Soft Sand CS as base and then a layer of Chocolate Kiss CS wrapped with 2 ribbons strips.. I used Mini Sunflowers (yellow) digital paper from All About Autumn that I framed with green CS using corner punch. I stamped sentiment on Soft Sand with Rich Cocoa and put on green mat. Corners were all rounded. Attached elements on to card. For final touch, added a sunflower to the corner that was cut out of digital paper with nesties. Colors all look better in real life than in pic. Stamps: GinaK- "Say It With Flowers"
This week, Creative Clear Stamps presented their first challenge - to give your card that little something extra with texture. This could be in the form of fabric, embossing, distressing, etc. 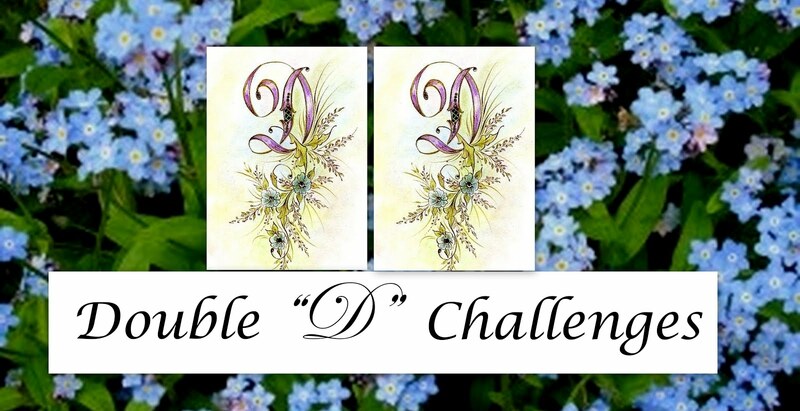 Janice's sketch challenge for STV is shown above. For my card, I used white CS that I embossed with CB Snowflakes. I cut a mat and stamped with a verse for Christmas and attached to a red mat and then to the card. I finished with 3 red rhinestones in corner and 4 smaller rhinestones to the mat with the verse. Tied a ribbon around the card and tied a bow. OOPs, the bow is crooked in the pic....was not that way! 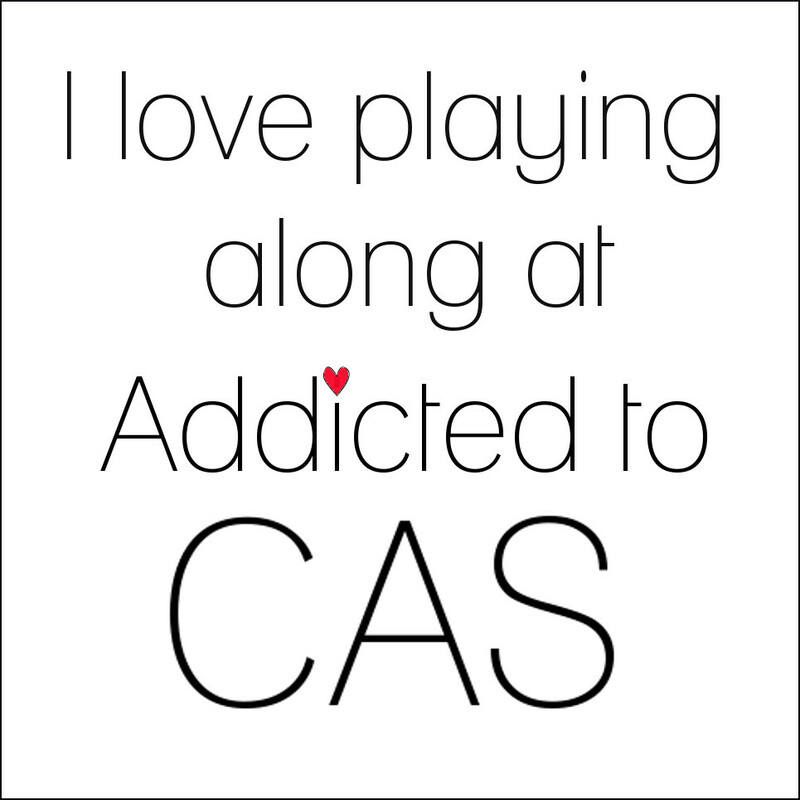 A Very Simple card....CAS for sure! Another Christmas Card done. Got to get some more stamps from CCS....they are great! Think I'll go shopping now. Stamps: Creative Clear Stamps- "Let It Snow"
Giovana's challenge this week is GOLD!! We are to create a project using something gold in it, it can be brads, ribbon, embossing powder, cardstock, to mention just a few. This is the "golden" card I designed. I had a beautiful gold moire CS that I have been saving for such an occasion. I began with a base of white CS, layered with a mat of red, topped with a mat of this beautiful gold, and another layer of red with gold brads in the corners. I cut a scallop oval of the gold and cut an oval of red with nestabilities. Using versamark, I stamped the red oval and heat embossed the image with Gold EP. Finished by attaching ovals to the card. I thought adding any ribbon or anything more would be over the top and over the cliff, so I stopped here. Wish the picture did justice to the beauty of the moire. Use your imagination. Stamps: Creative Clear Stamps-Tree from "Let It Snow"
STV- Making Shimmering Background Paper! 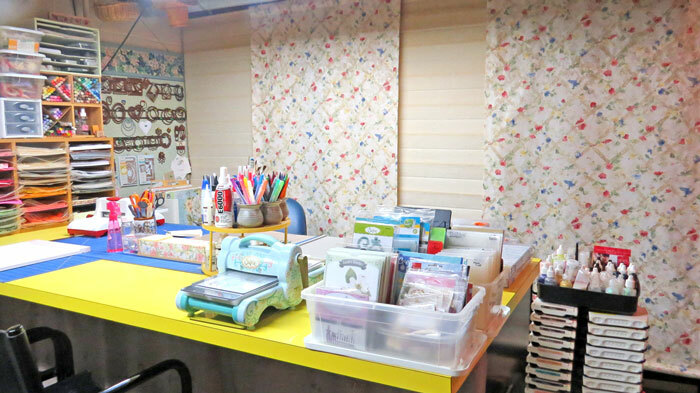 This week Gina K demonstrated how to make your own Shimmering Background Paper! Please go to http://stamptv.ning.com/ to see how easy this is. For her technique challenge,I made this card starting with a base of white and added a layer of red. I cut and embossed white CS with CB Snowflakes and added shimmer using a Stardust Glitter pen on the design to make the background paper. I cut a scalloped oval in red and an oval in white using nestabilities. I stamped the tree using black ink and colored with markers and gold pen. I placed a gold ribbon around the embossed mat and assembled the rest of the card. Such a simple and quick card. Sentiment is stamped inside the card. 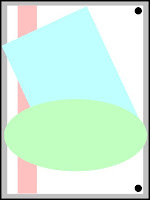 Joy's colors for this challenge are Pink, Navy, and Ivory or White. I decided to do a Christmas card since I have been trying to decide on a design for this year's cards. I uesd navy as a base, layered a mat of white, and another mat of navy. 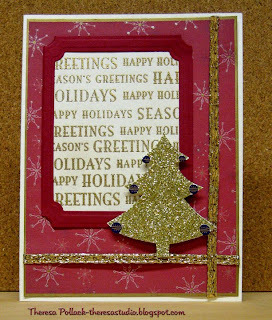 Then added a layer of DP called "Dot to Dot Pink" which I embossed with CB Snowflakes (Hard to see in pic). DP kinda reminds me of snowflakes--may be a stretch. I stamped the snowman on a circle and colored sky, coat, nose, and hat with markers and pencils. Colored nose pink too...wanted to stay within the rules. LOL. I paper pieced the scarf and buttons. Added some stickles to snow and snowman. He is such a "Jolly Little Soul"! Matted him off center on a round navy mat and attached to card. Stamped sentiment and added pink ribbon to corners. Stamps: Creative Clear Stamps-"Let it Snow"